Have you set up your must have list yet for when baby arrives? If you have you’ll know a crib with a suitable mattress is high on that list. Your baby’s comfort and safety at night is a high priority. Becoming a new parent is both exciting and nerve-racking. There are so many things to consider when preparing your child’s nursery such as creating a safe & comfortable environment. Selecting the right crib mattress is important because your child will be spending most of his or her time in the crib. You’d want to invest in a good quality mattress that’ll put your mind at ease when your baby is sleeping. Buying a crib mattress can be far more complicated than choosing the theme or color for the nursery. There are so many options available that can leave you confused & in doubt. Let’s summarize some of the important factors you should consider when purchasing a crib mattress. If you’re buying a mattress for your new born, make sure to select a crib mattress that’s specifically designed for babies. The major difference will be the firmness of the mattress. Although a firm mattress might be uncomfortable for an adult to lay on, it’s of extreme importance for babies. A firm mattress will help prevent SIDS in babies which is probably the number one concern parents with new-borns have. It’ll also help with your baby’s muscle & strength development. A toddler mattress can have a slightly softer surface. f you’re looking at a long term option for your baby you can select a two in one mattress. These mattresses have different designs on each side. One side of the mattress will be firm enough for a new born or younger baby and the other side will be softer for when the baby grows older. It’s extremely important that the mattress you buy is not too small for the crib. There are different crib sizes and even shapes. It’s advisable to buy your crib first. This way you can measure the cot buy a perfectly fit mattress. Always follow the two finger rule. You shouldn’t be able to fit more than two fingers between the mattress and cot. This is to prevent your baby from getting stuck between the two and accidently suffocate. More and more parents are investing in organic mattresses and medical professionals agree that it’s a better option. Harmful chemicals are left behind on mattresses after the manufacturing process. The chemicals might aggravate any medical conditions your baby might already be suffering from such as asthma. Organic mattresses will ensure a safe & natural environment for your baby. Mold, bacteria & odor will result from a wet mattress. Mattress vents will prevent moisture from building up thus keeping the mattress clean and hygienic. It’ll also allow for easier breathability if your baby accidently rolls to a face down position on the mattress. Why we like it: We always love a good investment don’t you? The Moonlight slumber mattress offers you two sides. One side is designed to be firm enough for a new-born. The other side is softer, making it ideal for your toddler. This is the perfect two in one organic toxic free mattress. This performance tested mattress provides an easy to clean waterproof fabric. The fabric is also a medical grade stretch knit making it anti microbial and odor resistant. You don’t need to worry about bed bugs living inside your little one’s mattress as it has SafeSewn seams preventing dust mites from penetrating the mattress. 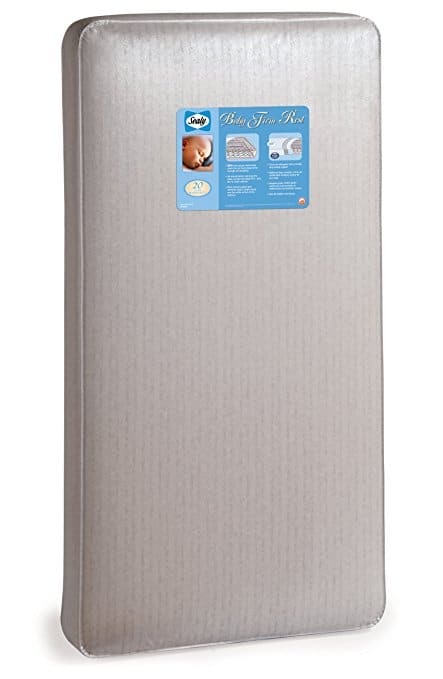 Extra firm plant base mattress for infants. The dual use mattress will be perfect for your infant to sleep on with a specially designed firm mattress side. Just flip the mattress over for a softer foam mattress that’ll be great for your toddler. Don’t use any harsh cleaning products on the mattress. Don’t clean the mattress with diaper wipes. Clean often using the correct instructions. Use a damp sponge or cloth without any cleaning products. 27.5” x 5” x 52 “. Layer two: Woven fire barrier. Layer three: High density foam with added plant oils. Layer four: Firm high density foam. The toddler side might still be too firm. Why we like it: The more research done the better when it comes to your children’s safety. This is one of the reasons we recommend the Colgate Eco Classica. It’s organic & GREENGUARD gold certified. It’s also light weight and ensures for easy sheet changes, a big help for any parent. 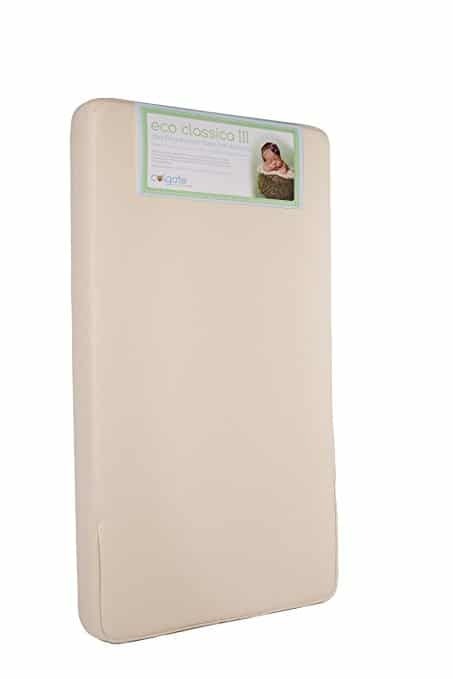 The Colgate Eco Classica offers you an orthopaedic style mattress. With the dual use that’ll grow with your child it’s a long term investment. It’s a high quality, breathable organic mattress. The foam is infused with plant oils making it a safe chemical free option for your baby. The certified organic waterproof cover will keep your baby dry & warm. The foam is made with non food plant oils & is CertiPUR-US certified. Firm mattress for infants to prevent SIDS. 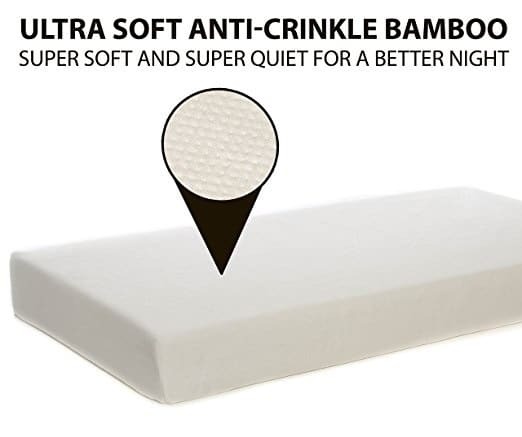 Suitable for infants and toddlers due to a dual side mattress. Contains more than 10 000 volatile organic compounds. Don’t use any harsh cleaning products or diaper wipes on the mattress. Often cleaning is needed to prevent odor or mold. Follow the correct cleaning instructions. Use a damp cloth to clean the mattress. 51.7” x 27.5” x 66”. Lead free foam & cotton. The mattress cover can’t be removed to be cleaned separately. Why we like it: What’s not to like about this mattress? It offers an anti sag design to give your baby optimal support. 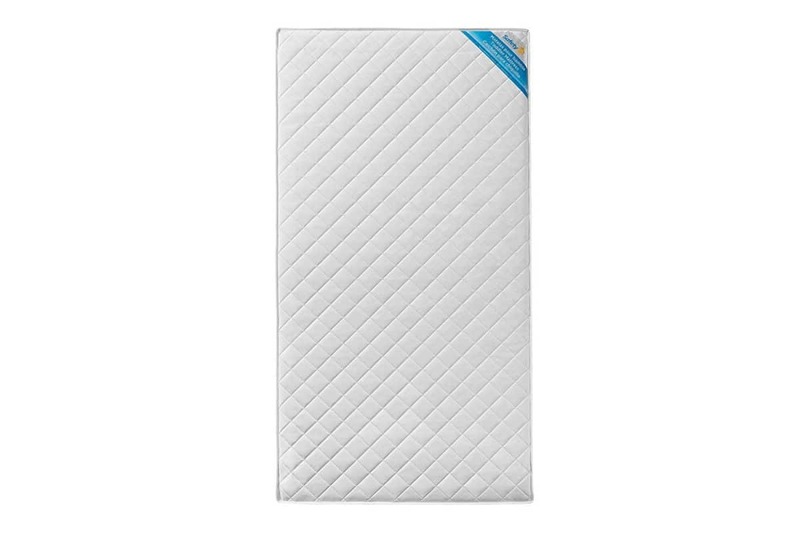 The hospital grade cover offers a hygienic surface for your baby to sleep on. This mattress has a luxurious feel and look with hypoallergenic cushioning wraps. The Seally baby firm rest provides optimal orthopaedic support with a 204 high coil system mattress. It’ll offer a safe space for your child with the American society safety and quality tests it passed. Heat tempered coil designed mattress for optimal firmness. Hospital grade material with anti bacterial properties to prevent illness. Toddlers & infants up to 99lb. 20 year warranty on materials & workmanship. Don’t use any harsh chemicals on this mattress. Wipe the waterproof surface with a damp cloth. 27.25” x 51.63” x 5.75”. Two layers non allergenic cushioning. According to some parents the mattress can be quite noisy when baby moves around. Why we like it: The Milliard memory foam mattress offers you so many extras for under 100$. Two of our favourite aspects about this mattress is the removable bamboo cover that’s included & the second feature we love is the dual use for babies and toddlers. The mattress has a foam base and memory top layer that’s guaranteed to not lose its form over time. The Milliard crib mattress offers you comfortable and affordable luxury. Designed with special airflow to regulate your child’s temperature. The mattress cover made from bamboo is machine washable and waterproof so you can easily remove & wash the cover. The memory foam is made with 3lb. construction that’ll not bottom out over time allowing you to use & enjoy this mattress as long as you’ll need it. Certified non toxic materials used. Natural fibre glass lining that meets all fire safety standards. Newborns, toddlers & older children. Removable waterproof machine washable bamboo cover. A layer of memory foam on top of the foam base. 3lb. construction to avoid the mattress form losing shape. Don’t use any harsh chemicals on this mattress or the mattress cover. Wipe the waterproof surface with a damp cloth for spot cleaning or remove the cover and wash in the washing machine, allow to dry before covering the mattress. The mattress can be spot cleaned using a wet sponge or cloth or alternatively steam cleaned. 27.25 x 52 x 5.5”. Removable bamboo cover allows for easy cleaning. Memory foam allows for comfortable sleep. Foam base ensures firm surface for babies. Dual use for babies and toddlers. No need to iron the bamboo cover as it’s a anti crease design. No noise when baby sleeps. You get a lot for the money you pay. Why we like it: This mattress will offer you a firm foam side for your newborn and smaller baby & a softer side with memory foam for your toddler and child up to 5 years. We’re very impressed with the list of harmful chemicals not used in the mattress such as mercury, lead and ozone depleters just to name a few. My First Crib Mattress and toddler bed mattress is specifically designed to last you more than just a couple of years. It’s made with safety and comfort in mind with the firm foam & memory foam options you have. It also comes with a removable machine washable mattress cover that’s waterproof to make cleaning easier. The mattress has been tested and approved to be durable & long lasting. Low volatile organic compound emissions. Made without Tris flame retardants. Babies 0-12 months of age & toddlers 1 – 5 years old. Removable waterproof machine washable cover. A layer of memory foam on the one side for your toddler’s comfort. 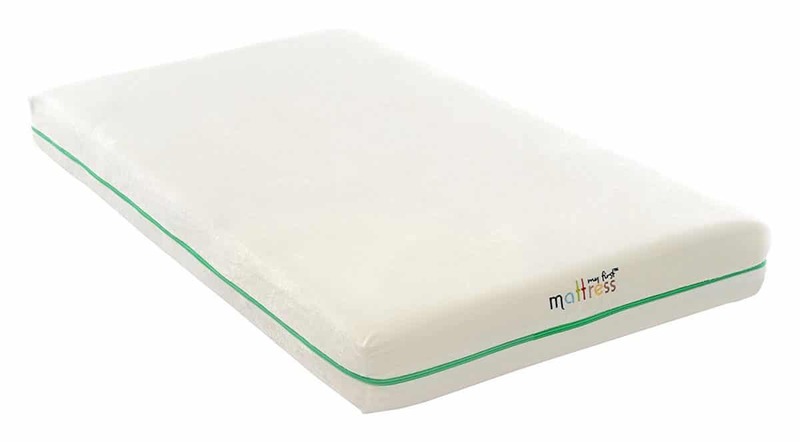 A layer of firm mattress foam on the other side for your infant’s safety. Made with durability to allow usage for up to five years of age. Don’t use any harsh cleaning materials on the mattress or the mattress cover. Remove the waterproof cover and wash in the washing machine, allow for it to dry thoroughly before covering the mattress again. Spot cleaning can also be done on the cover by using a damp cloth or sponge on areas that needs cleaning. Mattress can be spot cleaned on both sides using a damp cloth. 51 -5/8” x 27–1/4” x 5”. Removable machine washable cover allows for easy cleaning. Value for your money since you can use it up and till the age of five years. Memory foam allows a comfortable sleep for your toddler. Firm foam layer allows for a safe environment for your newborn & prevents SIDS. The mattress cover isn’t crease free so you’d have to iron it for a smooth appearance. Why we like it: This mattress had us at temperature control. Every parent knows how difficult it can be to keep your toddler warm or cool enough. The moonlight slumber dual mattress offers a temperature controlling cool gel memory foam on the one side for when your little one grows older. It also includes a removable washable cover that’s odor, water & stain resistant. 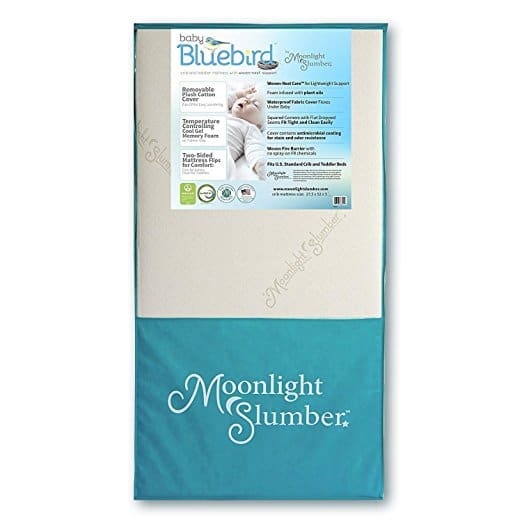 Moonlight slumber Blue Babybird Dual Sleep Mattress is the perfect mattress for parents who want a little bit extra. With a plant oil infused firm foam side your infant will be safe & comfortable. The memory foam side is designed to give your toddler premium support and comfort. The organic cotton cover can be removed and washed separately to allow for an easy clean. You’ll surely agree with us when we say this mattress is the ultimate luxury buy for your child. Firm plant base for newborns. Newborns up to toddler years. Removable waterproof 30% organic cotton machine washable cover with zip off feature. A layer of memory foam on the one side for your toddler. A layer of firm plant infused mattress foam on the other side for your infant. Cooling gel temperature regulating foam. Lightweight woven nest core for easy handling of the mattress. Don’t use any harsh cleaning chemicals on the mattress or the mattress cover. Remove the waterproof cover and wash separately in the washing machine. Spot clean when needed using a damp cloth or sponge on areas that needs cleaning. Mattress can be spot cleaned on both sides using a damp cloth or sponge with no cleaning material. 27.5” x 52” x 5”. Plant oil based foam on one side. Mattress cover is odor & stain free. Dual design for babies and toddlers. Memory foam allows a comfortable sleep for older children. Firm foam layer with infused plant oils allows for a safe environment for your newborn. Cool gel foam regulates temperature of your baby. The mattress cover isn’t crease free. 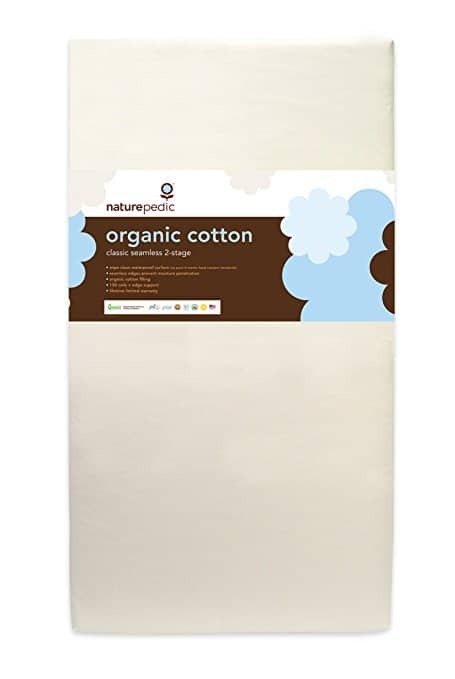 Cover isn’t 100% organic cotton. No vents or air pockets. Why we like it: This is one of the only mattresses that’s 100% cleanable. It’s a great way to ensure your child has a hygienic surface to sleep on. It’s also scientifically proven to have a significant lower suffocation risk because of the air circulation design. 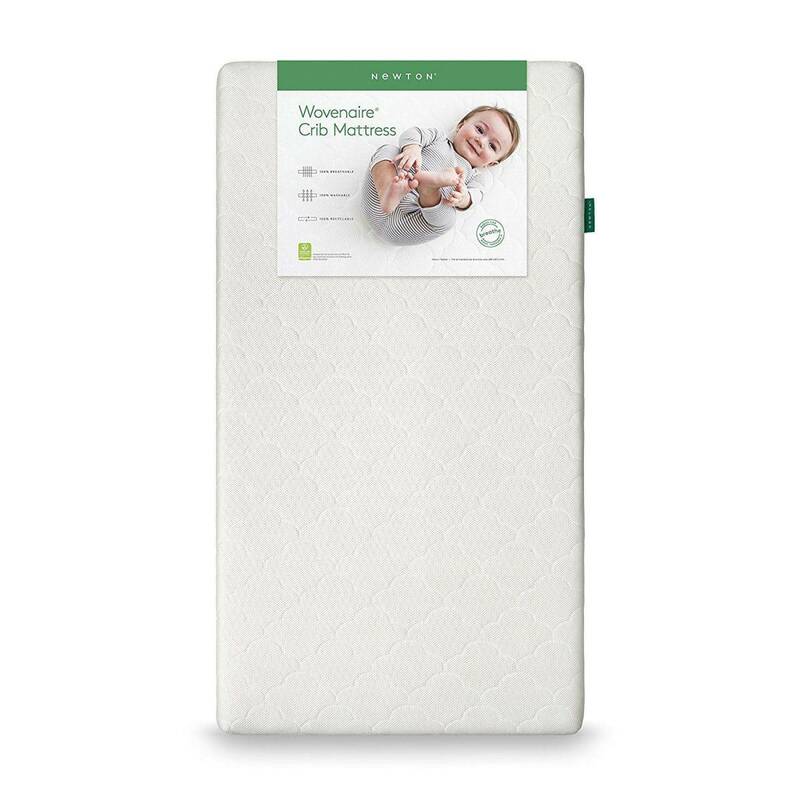 The Newton Wovenaire crib mattress comes with a machine washable 3D spacer that can also be tumble dried allowing for easy cleaning. Temperature regulation and breathability are two of the features that makes this a unique design to offer your child the best. The Wovenaire core is 90% air and 10% food-grade Polymer for optimal comfort. Prevents SIDS due to extra breathability. 3D fabric for extra comfort. Don’t wash the mattress with warm water or apply heat to it as it may cause shrinkage. Don’t use any harsh chemicals on the mattress or cover. The mattress isn’t safe tumble dryer friendly. Remove the waterproof cover and wash separately in the washing machine with cool or cold water. It can then be air dried or tumble dried on a low heat setting. The mattress can be washed in the tub with cool or cold water and air dried. Spot cleaning can be done as needed using a damp cloth. 52” x 28” x 5.5”. 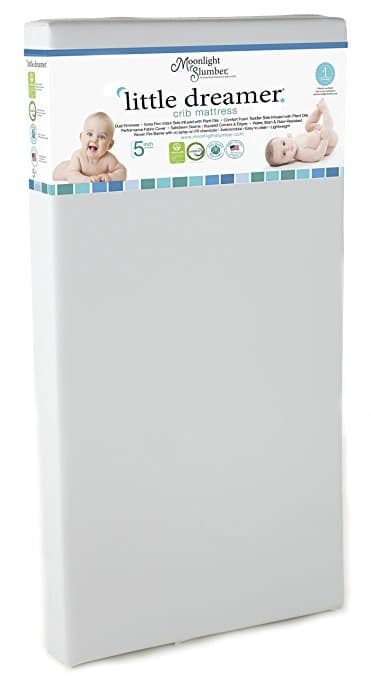 The removable machine washable cover has a beautiful 3D cloud design. Mattress cover is tumble dyer safe. You can wash the entire mattress. Extra breathability allows a decreased risk for SIDS. The breathable fabric allows for temperature regulation. Might be too firm for a toddler. Why we like it: The NaturePedic mattress is filled with only organic cotton assuring a natural non toxic sleeping environment for your baby. You don’t have to be worried about the firmness of the mattress as it has 150 coil springs & a 9 gauge outer setting providing optimal support to newborns. The NaturePedic Mattress has a waterproof cover that also offers hypoallergenic benefits such as keeping dust mites out of the mattress. The seamless edging prevents bacteria and dirt to build up in hard to clean places. This mattress is a great option for parents wanting to go the natural route. Firm mattress to prevent SIDS. Don’t use any harsh chemicals on the mattress surface. Spot clean when needed using a damp sponge or cloth without any harsh chemicals. 54.5” x 29.5” x 7.5 ”. Organic with 100% cotton fabric used. Spring coils allows for a firm safe base for newborns. The mattress can be on the heavier side making sheet changes challenging. Cotton is known to sink over time. Why we like it: This mattress will offer you dual use for your infant and toddler. The toddler side provides extra cushioning to give your child extra comfort and luxury. The Safety 1st mattress is a lightweight mattress with two sides: One side for your infant that’s firm enough for optimal safety and the other side for when your baby grows into his or her toddler years. The cover is made with waterproof fabric to allow for easy cleaning & to prevent liquids form penetrating into the mattress. This dual side mattress is suitable for newborns, older babies & toddlers. Extra cushioning on the toddler side. Won the women’s choice award. Don’t use any cleaning material on the mattress surface. Spot clean when needed. Use a damp cloth or sponge to wipe off any dirt. 52” x 27.5” x 5”. High density thermo bonded fibre. Cushioning for toddler use providing extra comfort. Firm & safe base for newborns preventing SIDS. You can’t wash the entire mattress. The waterproof cover isn’t removable. Why we like it: We love the idea of good craftmanship. How and where the mattress is made matters. This mattress is made with soybean oils provided by American farmers. 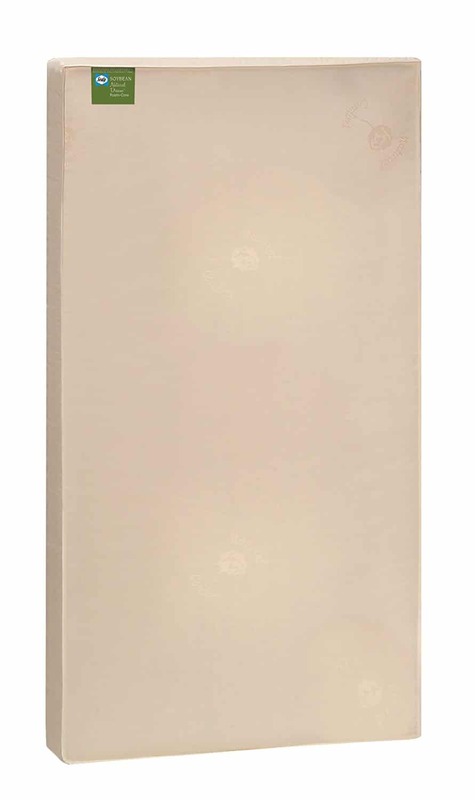 The soybean foam core provides an anti sag comfortable surface. The Sealy soybean mattress has a cotton cover that’s stain, odor and water resistant. The extra firm base is lightweight and provides optimal safety for your newborn. The square corner design provides a snug fit for most US cribs and toddler beds. Firm support for newborn babies. This mattress is suitable for newborns & toddlers. Don’t use any cleaning material on the mattress surface. This mattress isn’t suitable for washing with detergents. Spot clean if needed. Use a damp cloth or sponge to wipe off any dirt without using any harsh chemicals. 27.25” x 51.36” x 5”. Soybean oils provide a more natural option. The cover is stain resistant. The cover is odor and waterproof resistant. Material provides a cool surface. You can’t wash the whole mattress. Might be too firm for a toddler mattress. Most mattresses will have an approved certification & that’s something you should definitely look out for. But do you know what the certifications & standards mean? Oeko-Tex Standard 100 certification: This is a worldwide uniform certification. If you see this certificate you’ll know there are no heavy metals in the mattress & some flame retardants were also not used in the making of the mattress. GREENGUARD environmental institute: This institute will test the mattress for harmful emissions. USDA logo: The logo that’ll tell you how the organic fibre was grown. GOTS: The Global Organic Textile Standard will be given to any mattress with a minimum of 70% organic fibres. SIDS or sudden infant death syndrome can be a frightening thought when you’re a new parent. When a baby under the age of one year dies unexpectedly while sleeping without warning or any specific reason, it’s called SIDS. Sleeping position: Your baby should be sleeping on his or her back for the first six months. This will prevent them from accidently suffocating due to not being able to turn or lift themselves up. It’s recommended that your baby stays on his or her back until the age of 12 months. It’ll however become harder to control as they’re able to move around by themselves. Soft toys: While it’s cute for cuddling outside the cot soft toys shouldn’t be left in your baby’s cot before the age of one year. Even after a year it’s best to keep the cuddle friends outside the sleeping area. Synthetic materials that’re used to make the soft toys can cause suffocation. Side by side: According to research having your baby sleep in your room for the first few months can possibly prevent SIDS. Put the crib next to your bed so you’ll be able to hear your baby’s breathing easily. Monitors: Invest in a baby monitor that also has a breathing pad. If your baby stops breathing the monitor alarm will go off to let you know. Heavy blankets: Although heavy blankets or duvets work great to keep older children warm and improves sleeping it’s recommended to cover infants with lightweight cotton or muslin blankets to prevent suffocation. Smoke free zone: Smoking during and after pregnancy have been linked to SIDS. Second hand smoking can increase your newborn’s chance for developing lung related illnesses such as asthma. It’s unsettling to think that your baby will be surrounded by toxins while sleeping so the obvious selection will be an organic, eco free & natural mattress. There are unfortunately no legal standards for this statement which makes it harder to select the best mattress. The mattress might be labelled organic referring to some parts of the mattress but not necessarily the whole mattress. In other words the organic mattress might have an 80% plastic cover. Buying necessities for your newborn can become costly. Optioning for second hand products can be a great way to save on unnecessary costs. However, some items are best to get brand new and a crib mattress is one of them. Hygiene: Bodily fluids & other liquids such as milk will most likely be left on a crib mattress. Cleaning the mattress doesn’t guarantee that you’ll get rid of growing mold inside the foam or any other bacteria. Quality: Buying a second hand mattress from an unknown source might leave you with a “fake” label or brand. Buying a new one is the best way to know what you’ll be getting. Long lasting: You have no way of knowing how long a second hand mattress have been used before the owners sell it to you. When you buy a new mattress you’ll have an accurate idea of how long the mattress will last your baby. Firmness: The firmness of a crib mattress will wear out over time making it unsafe for a newborn. Buying a new mattress will enable you to get the best out of the mattress. Some mattresses come with a built in mattress cover. Most of these covers aren’t removable making it harder to clean properly. It’s advisable to get a waterproof mattress cover to prevent liquids from penetrating into the mattress. A mattress cover can be easily removed for proper cleaning. If you prefer a cotton cover you can get a waterproof mattress pad that’s placed between the cover and mattress to protect your mattress. When buying appliances and products the first thing consumers look for is a warranty and the longer it’s for the better. Although a warranty can be a good indication of the manufacturers’ confidence in their products it’s not worth paying more for one. Try to get a mattress with a warranty in the same price range as mattresses without one. If you can’t get a mattress with a warranty without having to pay more don’t be too worried about it. Any good quality well known brand mattress should last you long enough. Your selection will greatly depend on what you’re looking for in a mattress. Innerspring mattresses are great options for parents looking for a firm mattress whilst memory foam mattresses provide a comfortable surface for toddlers. Parents will know the famous saying “sleeping like a baby” is not always the case especially when your baby reaches a milestone or when the first signs of teething start. However when you’re lucky enough to have a sleeping baby in the crib, you want to be confident that your baby is safe & comfortable. Start this exciting journey of parenthood by investing in a good quality mattress for your baby from day one.